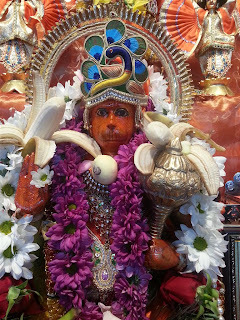 Paramahamsa Sri Swami Vishwananda / Bhakti Marga: Why is Lord Hanuman’s body covered in Sindoor? In most Hanuman temples the murthis of Hanumanji are covered or coated with orange coloured sindoor. Why is this so? “All married ladies do this for ensuring a long life for their husbands,” Sita smiled. Hearing this, Hanuman right away smeared sindoor all over his body! This is how devoted he was to Lord Rama – he wanted to absolutely make sure he had a long, long life. Sri Rama was pleased with this gesture of Hanuman and gave a blessing to him that anyone who offers Sindoor to Sri Hanuman will have all his hurdles removed and will be blessed with a long and happy life.